ABSTRACT. Podocalyxin (PC) is the major sialoglycoprotein expressed on the apical membrane of the podocyte. Previously it was shown that PC is connected to actin through the PC/NHERF2/ezrin complex, and this connection is disrupted in the nephrotic syndrome. For assessing whether expression of PC affects the organization of the actin cytoskeleton, MDCK cell lines stably expressing either full-length PC or a PC mutant lacking the NHERF binding site was established. It was found that full-length PC but not the PC mutant is connected to actin, induces redistribution of actin toward the apical membrane, and leads to increased RhoA activity. By immunofluorescence redistribution of RhoA and RhoGDI was observed in the presence of both full-length PC and the PC mutant. With the use of pulldown assays, PC and ezrin were found to interact directly and the ezrin binding site was mapped to the juxtamembrane region of PC’s cytoplasmic tail. It is concluded that PC binds to ezrin both directly and indirectly. PC activates RhoA through NHERF and ezrin, leading to redistribution of actin filaments. These results suggest that in podocytes, PC may also regulate foot process architecture through RhoA. The unique foot process and filtration slit architecture of podocytes is essential for maintaining glomerular filtration. Disruption of this organization is characteristically seen in glomerular diseases associated with the nephrotic syndrome. Although the molecular mechanisms that lead to these derangements are not yet fully understood, it has been shown that the dense actin network present in the foot processes is normally anchored to apical and basal membrane proteins as well as to proteins in the slit diaphragm region (1) and undergoes substantial changes in the nephrotic syndrome (2–6⇓⇓⇓⇓). We have previously shown that podocalyxin (PC), the major apical sialoglycoprotein of the podocyte, serves as an anti-adhesin that maintains the filtration slits between the foot processes open (7) and is connected to the actin cytoskeleton indirectly through NHERF2 (8), a PDZ protein, and ezrin, a member of the ERM (ezrin-radixin-moesin) family of actin-binding proteins (9). Moreover, we found that the connection of PC to the actin cytoskeleton is disrupted in puromycin aminonucleoside nephrosis (8), a rat model in which there is a dramatic reorganization of the actin cytoskeleton (5,6⇓). In this article, we investigate how the association of PC with actin is regulated, focusing on the small GTPase RhoA, because RhoA has been shown to activate ezrin (10) and ezrin connects various plasma membrane proteins, including PC, to actin filaments in its open or active conformation (11). Activated ERM proteins also bind and sequester RhoGDI (12–15⇓⇓⇓), a negative regulator of Rho GTPases, thereby initiating the activation of RhoA (13) and maintaining ERM activation (16). Moreover, it is clear that proper regulation of Rho GTPase is required for maintaining the differentiation of podocytes, as RhoGDIα −/− mice, lacking RhoGDIα, show massive proteinuria and loss of foot process architecture (17). In this study, we used MDCK cells to investigate further the connection of PC to actin, to assess the effects of expression of PC on actin organization, and to determine the involvement of RhoA in these effects. We show here that expression of PC leads to redistribution of actin and RhoGDI toward the apical membrane and activation of RhoA. Our findings suggest that in the podocyte, PC participates in the organization of the actin cytoskeleton that maintains the foot process architecture through activation of RhoA. PC mAb 5A (18) and rabbit polyclonal 0601 which recognizes the cytoplasmic tail of PC (7) were described previously. Anti-EBP50 (NHERF1) was provided by Dr. Anthony Bretscher (Cornell University, Ithaca, NY), and polyclonal anti-E3KARP (NHERF2) was provided by Dr. Chris Yun (Johns Hopkins University, Baltimore, MD). Anti-ezrin (3C12) was purchased from NeoMarkers (Fremont, CA), and anti-RhoA (26C4) and anti-RhoGDI (A-20) were purchased from Santa Cruz Biotechnology (Santa Cruz, CA). MDCK cells and HEK293 cells were maintained as described previously (19). MDCK cells stably expressing PC or mutant PC(ΔDTHL), lacking the last four amino acids of the cytoplasmic tail that constitute the NHERF binding site, and those expressing empty vector were generated using a retrovirus system as described in detail elsewhere (19). MDCK cells that were grown on glass coverslips or Costar Transwell filters (Corning, Palo Alto, CA) for 3 d after confluence were fixed in 2% paraformaldehyde, permeabilized, and incubated sequentially with primary antibodies (7) followed by cross-absorbed Alexa 488 or Alexa 594 goat anti-rabbit or anti-mouse F(ab′)2 (Molecular Probes, Eugene, OR). Actin was detected with Texas Red-phalloidin. Cells were examined with a Zeiss Axiophot equipped for epifluorescence or a BioRad MRC1024 confocal microscope equipped with Lasersharp 3.1 software. Vertical sections were generated in 0.3-μm steps. Axiophot images were acquired with a Hamamatsu ORCA-ER camera and processed with Scion Image software. Confocal images were processed with Adobe Photoshop. Cells were lysed in 0.5% Triton X-100, 20 mM Tris-HCl (pH 7.4), and 150 mM NaCl that contained Complete protease inhibitor mix (Roche, Indianapolis, IN). Proteins were quantified using the Bradford assay (BioRad, Hercules, CA), heated 5 min at 95°C in Laemmli sample buffer (LSB), separated by SDS-PAGE, and transferred onto polyvinylidene difluoride membranes. Membranes were incubated (2 h) with primary antibodies followed by horseradish peroxidase-coupled secondary antibodies and detection by chemiluminescence. Protein bands were quantified by densitometry using Scan Analysis Software (BioSoft, Cambridge, England). MDCK cell lysates (20 μg) were suspended in dephosphorylation buffer (50 mM Tris [pH 9], 1 mM MgCl2, 0.1 mM ZnCl2, and 1 mM spermidine), mixed with 15 U of alkaline phosphatase (Roche), incubated at 30°C for 30 min, and immunoblotted for NHERF1. In controls, alkaline phosphatase was omitted and 200 nM okadaic acid was added to inhibit serine/threonine phosphatases. Differential detergent extraction of cells was carried out as described previously (8). Briefly, cells were lysed in 0.5% Triton X-100, the lysate was centrifuged, the pellet was reextracted with RIPA buffer (0.1% SDS, 0.5% sodium deoxycholate, 1% Triton X-100, 150 mM NaCl, 20 mM HEPES, pH 7.4, and 1 mM EDTA), and the lysate was again centrifuged. LSB was added to the Triton-soluble (TS), RIPA-soluble (RS), and RIPA-insoluble pellet (RI), and equal volumes of each fraction were analyzed by immunoblotting. A pulldown assay for active RhoA was carried out with a GST fusion protein containing the Rho-binding domain (GST-RBD) of Rhotekin (provided by Dr. Martin Schwartz, University of Virginia, Charlottesville, VA) (20). MDCK cells were lysed in 1% Triton X-100, 0.5% sodium deoxycholate, 0.1% SDS, 50 mM Tris-HCl (pH 7.2), 500 mM NaCl, and 10 mM MgCl2 that contained Complete. After centrifugation, lysates were incubated (90 min at 4°C) with 10 μg of GST-RBD immobilized on glutathione-agarose beads. Bound proteins were eluted in LSB, and RhoA was detected by immunoblotting. cDNA encoding the cytoplasmic tail of PC (PCT) or the PCT(ΔDTHL) mutant were amplified by PCR and inserted into pGEX-KG (Amersham Pharmacia Biotech, Piscataway, NJ), and GST fusion proteins were produced. 35S-labeled ezrin or a N-terminal fragment of ezrin (amino acids 1 to 310) were produced by TNT T7 Quick Coupled Transcription/Translation system (Promega, Madison, WI) in the presence of [35S]methionine and pCR3 constructs (provided by Dr. Heinz Furthmayr, Stanford University, Stanford, CA). In vitro translation products were incubated (2 h at 4°C) with GST or GST fusion proteins immobilized on glutathione-Sepharose beads in 200 mM NaCl, 20 mM Tris-HCl (pH 8), and 0.2% Triton X-100 that contained Complete. Bound proteins were analyzed by autoradiography. cDNA encoding PCT and a truncated PCT (PCT-ΔN) lacking the 12 N-terminal amino acids of the cytoplasmic tail (HQRISQRKDQQR) were amplified by PCR and inserted into pET28 (Novagen, Madison, WI). The QuickChange site-directed mutagenesis kit (Stratagene, La Jolla, CA) was used to introduce point mutations in the PCT changing residues H411, R413, and S415 to alanines. His-tagged proteins (His-PCT, His-PCT-ΔN, His-PCT-S/A, His-PCT-HR/AA, and His-PCT-HRS/AAA) were produced according to the manufacturer’s instructions. Ezrin and N′-ezrin were amplified by PCR and inserted into pGEX-KG, and GST fusion proteins were produced. His-tagged PCT or PCT mutants were incubated for 2 h at 4°C with GST alone, GST-ezrin, or GST-N′-ezrin in 500 mM NaCl, 20 mM Tris-HCl (pH 8), and 0.2% Triton X-100 that contained Complete, and bound proteins were detected by immunoblotting. MDCK cell lines were generated that stably express PC (MDCK-PC) or a mutant (MDCK-PC[ΔDTHL]), lacking the four C-terminal amino acids that constitute the PDZ binding motif through which PC binds the PDZ proteins NHERF1 and NHERF2 (8). A control cell line (MDCK-mock) was infected with empty retrovirus. PC was detected at the expected size, 140 kD, in MDCK-PC and MDCK-PC(ΔDTHL) cells but not in controls that lack endogenous PC (Figure 1A). Ezrin migrated at ∼81 kD, and NHERF1 migrated as several bands, 48 to 52 kD, in all cell lines. By densitometry, the upper NHERF1 bands represent ∼60% of the total NHERF1 signal in MDCK-PC cells and only 40% in the other cell lines. After alkaline phosphatase digestion (Figure 1B), only the 48-kD band was seen, indicating that the upper bands represent phosphorylated forms of NHERF1. Increased phosphorylation of NHERF1 was not seen in the PC mutant lacking the NHERF1 binding site, suggesting that direct binding of PC to NHERF1 is required for enhanced phosphorylation of NHERF1. NHERF2 was not detected in any of the MDCK cells. Figure 1. Expression of podocalyxin (PC), ezrin, NHERF1, and NHERF2 in MDCK cells. (A) Exogenous PC is present in MDCK-PC and MDCK-PC(ΔDTHL) cell lysates but not in MDCK-WT and MDCK-mock cells. Endogenous ezrin and NHERF1 are present in all cell lines at similar levels, whereas NHERF2 is absent. NHERF1 migrates as several bands, 48 to 52 kD. In MDCK-PC cells, the 48-kD band is decreased, and the upper, ∼52-kD band is increased. Cell lysates (20 μg) were separated by 7.5% SDS-PAGE and immunoblotted with anti-podocalyxin 5A (1:1000), anti-ezrin 3C12 (1:500), anti-NHERF (1:1000), and anti-NHERF2 (1:1000). (B) Identification of phosphorylated forms of NHERF1. After alkaline phosphatase treatment of MDCK-PC cell lysates, the higher molecular weight forms of NHERF1 disappear and the 48-kD form is correspondingly increased. MDCK-PC cell lysate (20 μg) was incubated without (−; lane 1) or with (+; lane 2) alkaline phosphatase for 30 min at 30°C, separated by 7.5% SDS-PAGE, and immunoblotted with anti-NHERF1 (1:1000). We next assessed the effect of expressing PC on the distribution of actin in MDCK cells by immunofluorescence. PC was seen exclusively along the apical membrane (Figure 2C) as previously reported (7). The apical targeting of PC in MDCK cells corresponds to the apical localization of PC in podocytes along the tops and sides of the foot processes above the level of the slit membranes (21). The PC(ΔDTHL) mutant was also localized mainly on the apical membrane, but some staining was also seen inside the cell (Figure 2F). Similar findings were recently reported for the same truncation mutant of rabbit PC expressed in MDCK cells (22). Figure 2. 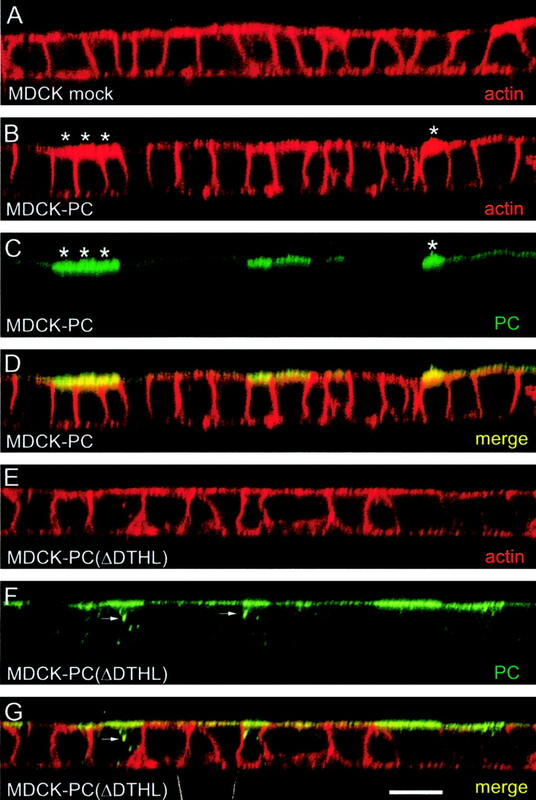 Distribution of actin and PC in MDCK cells as seen by confocal microscopy (vertical or X-Z sections). In MDCK-mock cells (A), actin is uniformly distributed along the apical, lateral, and basal domains of the cell membrane. In MDCK-PC cells (B through D), actin staining is increased at the apical domain (B) and overlaps with PC located along the apical domain (C). The increase in apical actin correlates with the expression level of PC (*). In MDCK-PC(ΔDTHL) cells (E through G), overlap of PC with actin at the apical domain (F and G) is not striking as in MDCK-PC cells, and some of the PC is found intracellularly (F, arrows). Cells were grown on filters, stained for actin with phalloidin-Texas Red (1:200) and for PC with mAb 5A (1:50), and analyzed by confocal microscopy. Bar = 15 μm. In MDCK-mock (Figure 2A) and MDCK-PC(ΔDTHL) (Figure 2E) cells, actin was distributed along the apical, lateral, and basal cell membranes with similar staining intensities. By contrast, in MDCK-PC cells, actin staining was increased along the apical and decreased along the basal domain (Figure 2B). The extent of the redistribution correlated with the expression level of PC (Figure 2C, D, and G). Horizontal views at the apical level showed that actin overlapped with PC (Figure 3, A through C) but not with the PC(ΔDTHL) mutant (Figure 3, D through F), and this overlap was greater in cells with high expression levels of PC. Taken together, these observations indicate that expression of PC in MDCK cells leads to redistribution of actin toward the apical membrane and that the interaction between PC and NHERF1 is required for this to occur. Next, we examined the association of PC and ezrin with actin using a differential detergent extraction method (8) that preserves cytoskeletal integrity and the interactions of noncytoskeletal proteins with the cytoskeleton (23,24⇓). Cell components were separated into TS, RS, and RI fractions (Figure 4). After extraction of MDCK-PC cells, PC was found in all three fractions: most of it was found in the TS fraction, but significant amounts were detected in the RS and RI fractions. As previously shown, some of the PC co-sediments with actin (9). In contrast, PC(ΔDTHL) was detected only in the TS fraction, indicating dissociation from actin filaments. Ezrin distributed in all three fractions, but the amount found in the RI fraction was increased twofold in MDCK-PC cells over controls, indicating that expression of PC leads to increased activation of ezrin and its association with actin. However, the amount of ezrin found in the RI fraction of MDCK-PC(ΔDTHL) cells was decreased twofold over controls. These results indicate that when full-length PC is expressed in MDCK cells, some of the protein is connected to the actin cytoskeleton. The increased solubility of the PC mutant indicates that ezrin alone is not sufficient to connect PC to the actin cytoskeleton. Rather, full engagement of PC with the cytoskeleton requires NHERF1 interactions with PC’s C-terminal PDZ binding domain. Figure 4. Distribution of PC and ezrin in fractions obtained by selective detergent extraction. In MDCK-PC cells, full-length PC is present in the Triton X-100-soluble (TS), RIPA-soluble (RS), and RIPA-insoluble (RI) fractions (lanes 7, 8, and 9, respectively), whereas in MDCK-PC(ΔDTHL) cells, the PC mutant is present exclusively in the TS fraction (lane 10). Ezrin is distributed in all three fractions in all cell types; however, in MDCK-PC cells, the amount of ezrin in the RI fractions (lane 9) is increased compared with MDCK-WT and MDCK-mock cells (compare with lanes 3 and 6). By contrast, in MDCK-PC(ΔDTHL) cells, the amount of ezrin found in the RI fraction was decreased (lane 12). MDCK cells were extracted sequentially as described in Materials and Methods. Equal volumes of the different fractions were immunoblotted for PC and ezrin as in Figure 1. Increased actin-bound ezrin indicates an increase in active ezrin in MDCK-PC cells. Because activated ezrin binds RhoGDI (12–15⇓⇓⇓), we investigated the distribution of RhoGDI in MDCK-PC cells versus controls. In vertical sections of MDCK-mock cells (Figure 5A) and MDCK-WT (not shown), RhoGDI was distributed throughout the cytoplasm, whereas in both MDCK-PC (Figure 5, B through D) and MDCK-PC(ΔDTHL) cells (Figure 5, E and F), the distribution of RhoGDI had shifted and was more concentrated at the apical membrane, where PC and the PC(ΔDTHL) mutant were found. The redistribution of RhoGDI in cells expressing the PC mutant lacking the NHERF binding site indicates that RhoGDI’s recruitment to the vicinity of PC does not involve binding to NHERF1. Figure 5. Distribution of RhoGDI and PC in MDCK cell lines. In MDCK-mock cells (A), RhoGDI is distributed throughout the cytoplasm, whereas in MDCK-PC (B) and MDCK-PC(ΔDTHL) (E) cells, RhoGDI is enriched along the apical membrane in cells expressing full-length and mutant PC. Apical RhoGDI enrichment is strongest in cells with the highest expression levels of full-length and mutant PC (*). Co-localization of RhoGDI and PC correlates with the expression level of PC (B through D). Cells were grown on filters and stained with anti-RhoGDI (1:200) and anti-PC 5A mAb (1:50) and analyzed by confocal microscopy. Bar = 15 μm. Active RhoA is known to translocate to the plasma membrane, where it interacts with various effector proteins to mediate downstream signaling and to affect the distribution and organization of actin. We reasoned that RhoA might also be redistributed in cells expressing PC, as binding of RhoGDI to activated ezrin dissociates the RhoGDI/RhoA complex, allowing subsequent activation and redistribution of RhoA (25). We found that in controls, RhoA was distributed throughout the cytoplasm and was most concentrated in the juxtanuclear region (Figure 6, A and B). In MDCK-PC (Figure 6C) and PC(ΔDTHL) (Figure 6D) cells, there was a partial shift in RhoA staining to the cell membranes. Thus, expression of PC or the PC mutant in MDCK cells results in redistribution of both RhoGDI and RhoA independent of NHERF binding to PC. Figure 6. Distribution of RhoA in MDCK cells. 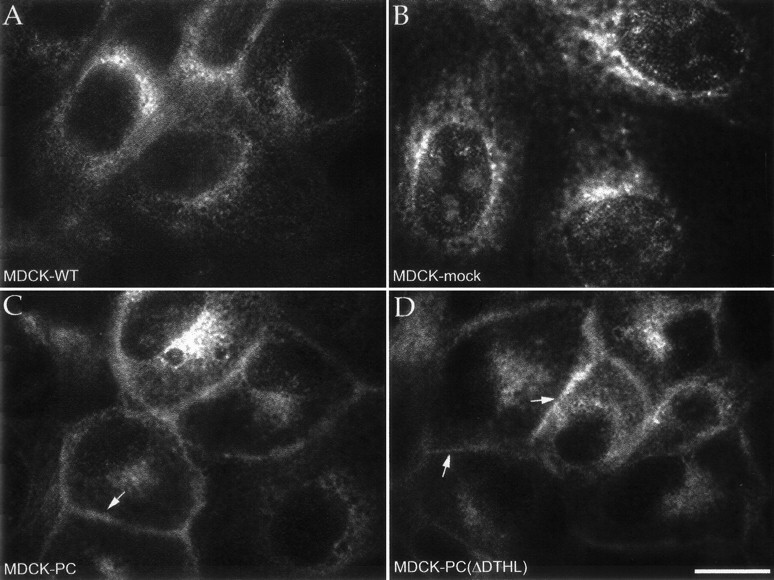 In MDCK-WT (A) and MDCK-mock (B) cells, RhoA is distributed throughout the cytoplasm, but is most concentrated in the juxtanuclear region. In MDCK-PC (C) and MDCK-PC(ΔDTHL) (D) cells, RhoA is distributed along the cell membrane (arrows), and cytoplasmic staining is typically decreased. MDCK cells were grown on coverslips, labeled with anti-RhoA (1:400), and examined by immunofluorescence microscopy. Bar = 5 μm. To determine whether RhoA activity is increased in cells expressing PC, we carried out a pulldown assay for active RhoA (20). 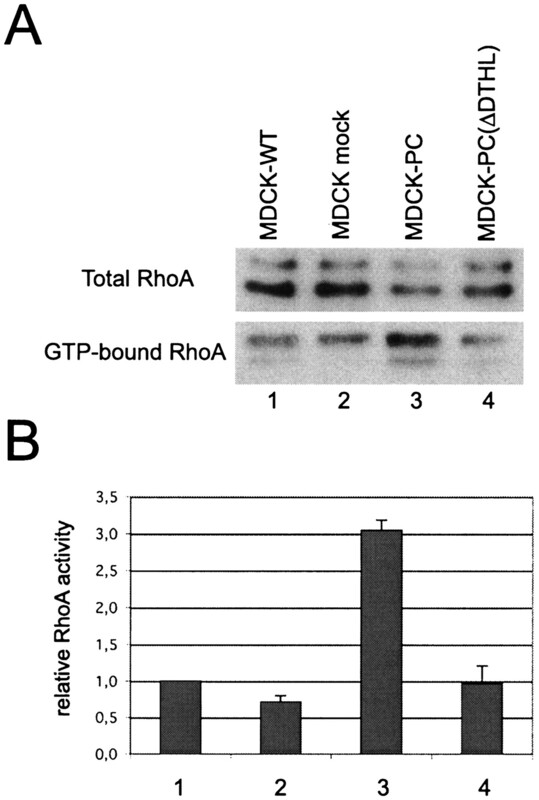 All MDCK cell lines showed similar levels of total RhoA, but the ratio of GTP-bound RhoA to total RhoA was threefold higher in MDCK-PC cells compared with the other cell lines, including MDCK-PC(ΔDTHL) cells (Figure 7). The absence of enhanced RhoA activity in the mutant indicates that expression of PC leads to increased RhoA activity through NHERF1. From these results, we conclude that interaction between PC and NHERF1 is not required for the redistribution of RhoGDI and RhoA, but it is required for activation of RhoA, the connection of PC to the actin cytoskeleton and redistribution of actin. Figure 7. Determination of RhoA activity in MDCK cells. (A) The amount of GTP-bound RhoA (bottom panel) in MDCK-PC cell lysates (lane 3) is higher than in the other cell lines (lanes 1, 2, and 4). The amounts of total RhoA in the lysates (top panel) are similar in all MDCK cell lines (lanes 1 through 4). A pulldown assay for GTP-bound RhoA was carried out as described in Materials and Methods. Total RhoA (5 μl of lysate) and GTP-bound RhoA (700 μl of lysate) were detected by immunoblotting with anti-RhoA mAb (1:400). (B) Graphic representation of the relative RhoA activity in MDCK cells. In MDCK-PC cells (lane 3), RhoA activity increased approximately threefold compared with MDCK-WT (lane 1), MDCK-mock (lane 2), and MDCK-PC(ΔDTHL) cells (lane 4). The amounts of total and GTP-bound RhoA were quantified by densitometry. The relative RhoA activity was calculated from the ratios of GTP-bound RhoA/total RhoA and normalized to the ratio obtained for MDCK-WT cells (lane 1). The recruitment of RhoGDI to the plasma membrane in cells expressing the PC(ΔDTHL) mutant missing the NHERF binding site was surprising, because we have previously shown that PC associates with ezrin through NHERF (8). It raised the possibility that PCT can bind directly to ezrin independent of NHERF. To test this possibility, we carried out a pulldown assay with GST-PCT or GST-PCT(ΔDTHL) and 35S-labeled, in vitro-translated N-terminal fragment of ezrin (N′-ezrin). With N′-ezrin, we observed binding to both GST-PCT and GST-PCT(ΔDTHL) (Figure 8A). Binding to GST-PCT(ΔDTHL) was weaker than to GST-PCT but was above that observed with GST alone. Full-length ezrin did not bind to any of the fusion proteins (not shown), most likely because it assumes an inactive head-to-tail conformation that partially masks the PC binding site (11). Figure 8. The cytoplasmic tail of PC (PCT) interacts directly with the N-terminal domain of ezrin. (A) In vitro-translated, N-terminal fragment of ezrin (N′ezrin) interacts with GST-PCT (lane 3) but not with GST alone (lane 2). Binding of N′ezrin to GST-PCT(ΔDTHL) (lane 4) is reduced compared with GST-PCT. Equimolar amounts of GST (5 μg), GST-PCT (7 μg), and GST-PCT(ΔDTHL) (7 μg) bound to glutathione-Sepharose beads were incubated with in vitro-translated, radiolabeled N′ezrin. Proteins bound to the beads were separated by 12% SDS-PAGE and analyzed by autoradiography. Lane 1 shows 100% of input. (B) Purified His-tagged PCT directly interacts with purified GST-N′ezrin (lane 3) and GST-ezrin (lane 4) but not with GST alone (lane 2). His-PCT (100 μg) was incubated with GST, GST-N′ezrin, or GST-ezrin (50 μg) bound to glutathione-agarose beads. Precipitates were separated by 12% SDS-PAGE and analyzed by immunoblotting using anti-PC 0601 (1:5000). Lane 1: 1% of His-PCT used in the assay. (C) Amino acid sequence alignment of the intracellular juxtamembrane regions of rat PC (accession no. NP 620203) and human intercellular adhesion molecule-3 (ICAM-3; accession no. NP 002153). Amino acids present in both sequences are indicated in bold. (D) Mapping the ezrin binding site in PCT with purified, recombinant proteins. Direct interaction between GST-N′ezrin and His-tagged PCT is reduced by 22, 46, 95, and 100%, respectively, in the following PCT mutants: His-PCT-S/A (lane 2), His-PCT-HR/AA (lane 3), His-PCT-HRS/AAA (lane 4), and His-PCT-ΔN (lane 5). Purified GST-N′ezrin (50 μg) was immobilized on glutathione-agarose beads and incubated with His-PCT, His-PCT-S/A, PCT-HR/AA, His-PCT-HRS/AAA, or His-PCT-ΔN (100 μg). Precipitates were analyzed by 12% SDS-PAGE and immunoblotted for PC as in B. Next, we carried out a pulldown assay using purified His-tagged PCT and GST-ezrin or GST-N′-ezrin. We found that His-tagged PCT bound to GST-ezrin as well as to GST-N′-ezrin but not to GST alone (Figure 8B). As above, binding was stronger for GST-N′-ezrin than for GST-ezrin. We conclude that PCT can bind directly to the N-terminus of ezrin. Sequence alignment (Figure 8C) revealed that the PCT possesses a sequence, HQRIS, in the juxtamembrane region that is similar to the HQRS sequence found in intercellular adhesion molecule-3 (ICAM-3) (26). 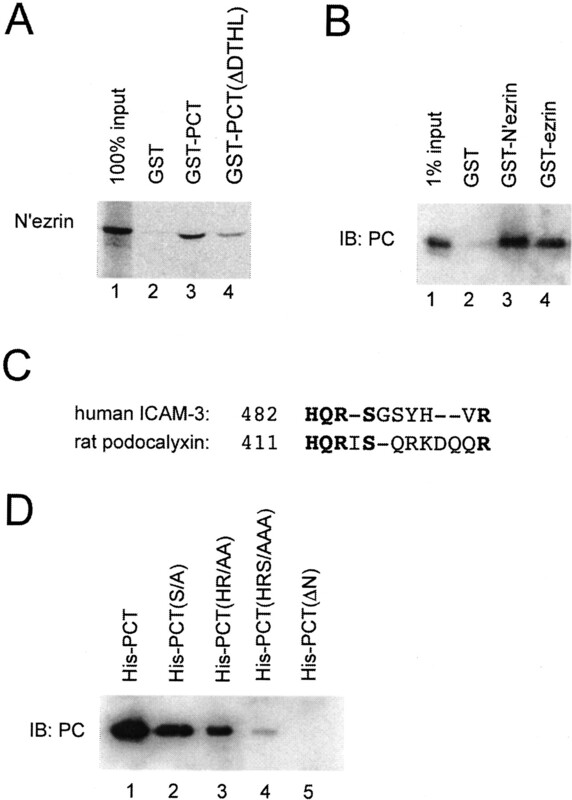 The basic residues H and R within this sequence and several serines in the cytoplasmic tail are required for interaction of ICAM-3 with ezrin (26). We tested the ability of His-tagged PCT containing either a single mutation of S415 to A (His-PCT-S/A), a double mutation of H411 and R413 residues to alanines (His-PCT-HR/AA), a triple mutation of all three residues (His-PCT-HRS/AAA), or a 12 residue, N-terminal truncation (His-PCT-ΔN), to interact with GST-N′-ezrin. We found that the interaction of these mutants with GST-N′-ezrin was reduced by 22, 46, 95, and 100%, respectively (Figure 8D). We conclude that the ezrin binding site is within the 12 juxtamembrane amino acids of PCT and that residues H411, R413, and S415 are essential for binding of PC to ezrin. The actin cytoskeleton is anchored to membrane proteins that provide structural support to the cell membrane, and its organization determines cell shape. In several glomerular diseases, especially minimal-change nephrotic syndrome, reorganization of the actin cytoskeleton accompanies changes in foot process organization of podocytes, but the molecular events involved remain unknown (2). We have shown that PC is connected to actin through NHERF and ezrin under normal conditions, forming the PC/NHERF/ezrin/actin complex, and is disconnected from actin in experimental models of nephrosis (8). Here we show that expression of PC in MDCK cells leads to phosphorylation of NHERF1, activation of ezrin, activation of RhoA, and redistribution of actin and that these effects are dependent on the interaction of PC with NHERF. Our findings support the following model (Figure 9) for the effects of PC on activation of RhoA and the assembly of the PC/NHERF1/ezrin/actin complex: PC binds to NHERF, which in turn binds activated ezrin. Activated ezrin initiates the activation of RhoA through its ability to bind and sequester RhoGDI, releasing GDP-RhoA (13). The presence of NHERF in the complex is required for the activation of RhoA. Once RhoA is activated, it signals downstream to maintain activation of ezrin, allowing connection of PC to actin at the apical cell membrane. This model is based on our observations and previous work by others as discussed below. Figure 9. Proposed model for the PC-induced reorganization of actin in MDCK cells through the RhoA pathway. PC interacts with ezrin both directly and indirectly through NHERF1. The juxtamembrane region of PC interacts directly with the N-terminus of ezrin. The C-terminal PDZ-binding motif of PC (blue arrow) interacts with the second PDZ domain of NHERF1. PC-associated ezrin recruits RhoGDI, releasing GDP-RhoA. In the presence of NHERF1, RhoA-GDP is converted to RhoA-GTP, possibly because NHERF1 recruits a guanine nucleotide exchange factor (GEF) for RhoA. Activated RhoA-GTP interacts with effector proteins that lead to activation of ezrin, connecting PC to actin and concentrating actin at the apical domain. Activated RhoA also can modulate tight junction structure and function (not shown). We found that RhoA activity is increased in cells expressing PC but not in those expressing the PC mutant lacking the NHERF binding site, indicating that interaction with NHERF1 is essential for activation of RhoA. NHERF proteins bind and organize various functional macromolecular complexes through their two PDZ domains, allowing, for example, the β2-adrenergic receptor (β2-AR)-mediated regulation of the Na+/H+ exchanger NHE-3 (27) or of cystic fibrosis transmembrane conductance regulator (CFTR) (28) and the reciprocal PKA-mediated regulation between CFTR and NHE3 (29). 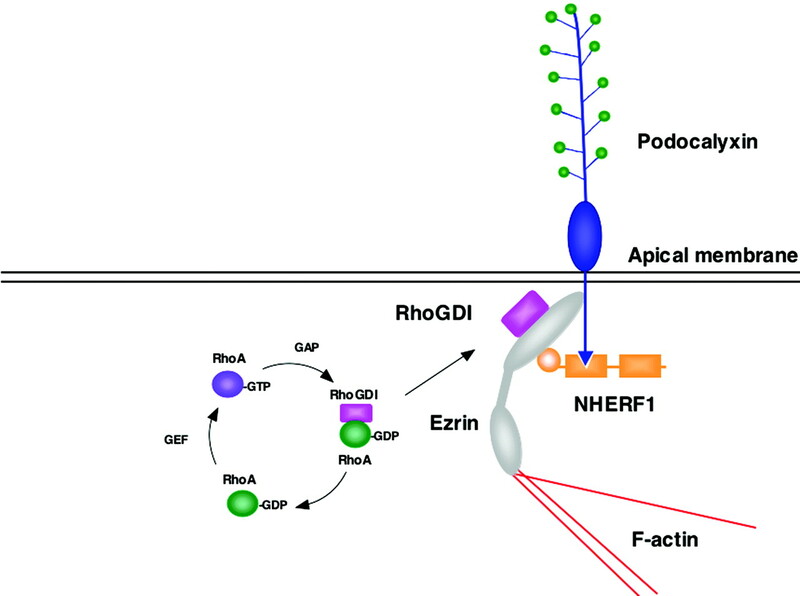 It is interesting that stimulation of β2-AR (30) and the P2Y1 purinergic receptor (31,32⇓)—both of which are connected to actin through NHERF1 and ezrin—have also been reported to activate RhoA. Thus, it seems likely that NHERF recruits a factor responsible for RhoA activation, possibly a RhoGEF. RhoA is known to activate ezrin (10) and to regulate the connection of ezrin-binding membrane proteins to actin (33,34⇓). The finding that expression of the PC(ΔDTHL) mutant does not activate RhoA and does not result in the redistribution of actin suggests that activation of RhoA is required for connection of PC to actin, probably because activated RhoA provides positive feedback that maintains ezrin in an active state capable of binding actin. In addition to the ability of PC to bind ezrin indirectly through NHERF, we found using pulldown assays that PC can bind directly to ezrin. PC is the first membrane protein found to interact with ezrin both directly and indirectly via NHERF. These two mechanisms—direct and indirect—have been described for the connection of membrane proteins to actin filaments through ezrin (11). One set of membrane proteins, e.g., CD44 (12), ICAM-1 (35), ICAM-2 (35), ICAM-3 (26), syndecan 2 (34,36⇓), and NHE1 (36), bind directly to ezrin, whereas the other, e.g., NHE-3 (37), β2-AR, and CFTR (27), interacts with ezrin through NHERF proteins. Using alanine mutagenesis and purified, recombinant proteins, we identified the binding site for ezrin in the cytoplasmic tail of PC. Sequence analysis had revealed that PC’s cytoplasmic tail contains an amino acid sequence HQRIS in the juxtamembrane region that resembles a sequence in ICAM-3 HQRS shown to be involved in ezrin binding (26). Mutational analysis confirmed that, as in ICAM-3, two positively charged residues histine and arginine (H411 and R413) and a serine (S415) are involved in the direct binding of PC to ezrin. Replacement of these residues with alanines reduced ezrin binding by 95%, indicating that these residues, which are conserved in rabbit and human PC, are crucial for the interaction. That binding of ezrin was totally abolished when the 12 juxtamembrane residues were removed provides further evidence that this region is essential for ezrin binding. The ezrin binding sites of PC, ICAM-3, and syndecan 2 seem to be distinct from the juxtamembrane clusters of three consecutive positively charged residues responsible for ezrin binding in CD44 (38), CD43, ICAM-1 (35), ICAM-2 (39), and NHE1 (36). Ezrin binding sites on membrane proteins are often located in the juxtamembrane region, which may allow for regulation of ezrin binding by phosphoinositides. Ezrin binds phosphatidylinositol 4,5-bisphosphate (PIP2) (43), and the interaction between ezrin and membrane proteins is facilitated by PIP2 (12,26,39⇓⇓). The functional significance of the direct interaction between PC and ezrin is not clear and requires further investigation. One possibility is that a direct interaction between PC and ezrin might allow transient disruption of the PC-NHERF interaction associated with regulatory events such as phosphorylation that might induce conformational changes of NHERF1 and the cytoplasmic tail of PC, both of which are known to be phosphorylated (41,42,43⇓⇓). We have previously shown that expression of PC in MDCK cells modifies the distribution of junctional proteins and decreases transepithelial resistance (7). RhoA and Rac1 are known to be involved in regulation of tight junction structure and function (44). Therefore, the available evidence suggests that PC participates in the regulation of tight junction structure and function through activation of RhoA, which is known to promote actin reorganization at the junctional level in MDCK cells (44,45⇓). During glomerular development, expression of PC correlates with the establishment of foot process architecture, opening of intercellular spaces, disappearance of tight junctions, and appearance of the slit diaphragms (46). In a previous report, we showed that PC’s ectodomain presents anti-adhesion properties that contribute to regulation of the maintenance of the filtration pathway between neighboring podocytes (7). Our finding that the cytoplasmic tail of PC is connected to the actin cytoskeleton (9) and that loss of glomerular foot processes is associated with disruption of the PC-actin connection (8) suggested that PC may contribute to regulation of podocyte cell shape through its cytoplasmic tail. Our present results in MDCK cells demonstrate that PC activates the RhoA pathway and induces actin reorganization, providing further support for this conclusion. This work was supported by National Institutes of Health Grant DK17724 (to M.G.F.) and by a German Academic Exchange Service Fellowship (to S.S.). We thank Dr. Larry Goldstein (University of California San Diego) for the use of his Bio-Rad MRC 1024 confocal microscope. S.S.’s current affiliation is Laboratoire de Physiologie des Membranes Cellulaires, Université de Nice-Sophia Antipolis/CNRS, La Darse, Villefranche sur mer, France.